First off, The New Yorker doesn’t have a cartoon editor. It has an Art Editor, they’ll have you know. It pays draftsmen (and ladies) fortunate enough to grace its pages not by the drawing, as logic might suggest, but by the square inch. This results in otherwise inexplicable paychecks such as $362.24 for a drawing that’s accepted. These and similar idiosyncrasies make The New Yorker the quirky institution that it is, which is precisely why Bob Mankoff’s visual and verbal musings about his decades at the magazine are delightful reading for everyone who has been either awed or intimidated by its pages. 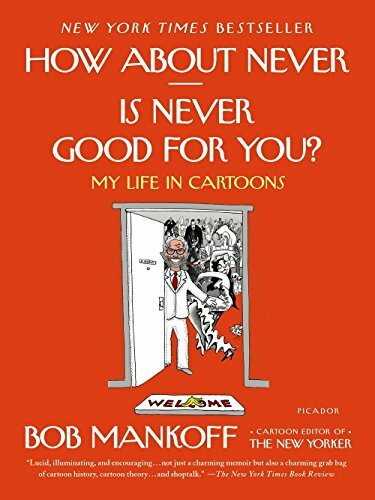 The recipient of 500 drawings a week, Mankoff first wants us to know “that evaluating humor is different from enjoying it.” He pares the submissions down to 50, which he then shows editor David Remnick at their weekly meeting. Working with three trays marked “yes,” “no,” and “maybe,” Remnick then pares it down to the 17 or so that make it into that week’s magazine. Along the way readers get a private look at how cartoonists think—the “doodlers” vs. the “word-firsters,” for example. We see how they tirelessly refine their work and submit an average of 10 cartoons a week, every week, knowing that most will be rejected. The more you submit, the better your chances, which holds for the caption content, too. Mankoff shows readers how to deconstruct a picture and caption, where the line is between playful incongruity and puzzlement that the reader doesn’t “get,” and what makes the winning cartoons that appear in The New Yorker so funny. As for the contest, The New Yorker goes for captions that are short, novel, don’t restate what’s in the image, and aren’t heavily punctuated (no exclamation marks!). If you want to win The New Yorker cartoon caption contest, read this book. Read it, too, for a behind-the-scenes look at the enterprise that makes us all smile. Week after week.